Make Pips Trading the March NFP! For those of you are new to class, if there’s one thing you gotta know about economic reports, it’s this: the nonfarm payrolls report is often regarded as the biggest and baddest granddaddy economic report on the block. Only the brave dare to try and trade the NFP report as it usually provides the most liquidity in the markets following its release. Most don’t wanna get caught in the whiplash and get burned right before the weekend! If you are the type who likes wild rides and crazy price action and wants to give trading tomorrow’s NFP report a shot, just make sure you read up and educate yourself! First thing’s first – you gotta know what happened at last month’s release. For the third consecutive month, nonfarm payrolls printed better-than-expected, coming in at 227,000, after it was projected to print at 209,000. Moreover, this also marked the third consecutive month that net jobs added came in above the 200,000 mark. For March, payrolls are anticipated to roll in at 205,000. If this happens, it would mark the first time since late 1999 that the labor market has been on such a roll. That was so long ago that we didn’t even have iPods yet! Considering the current market environment, I think that analysts will be paying particular attention to this week’s NFP report. Remember, just last week, my man Ben Bernanke laid the smackdown on the dollar when he readjusted everyone’s expectations and left the door open for more quantitative easing. In a speech at the National Association for Business Economics Annual Conference, Bernanke said that more stimulus may be necessary in order to support the economy. According to the Fed president, there is enough weakness in the economy to warrant additional quantitative easing measures. He even pointed out some concerns about the state of the labor market. Yikes! This was quite the shocker to the markets, because at the previous FOMC statement, the Fed had actually acknowledged some improvement in the U.S. economy. That said, I think that tomorrow’s report could go a long way in swaying both the market’s perception of the job market and the Fed’s overall outlook. Knowing that anything can happen, it is of utmost importance to consider different scenarios when trading the NFP report. For starters, let’s take a look at how EUR/USD and GBP/USD reacted to the NFP numbers last month. Remember, the NFP report printed an additional 227,000 jobs in February when analysts were only expecting 209,000. 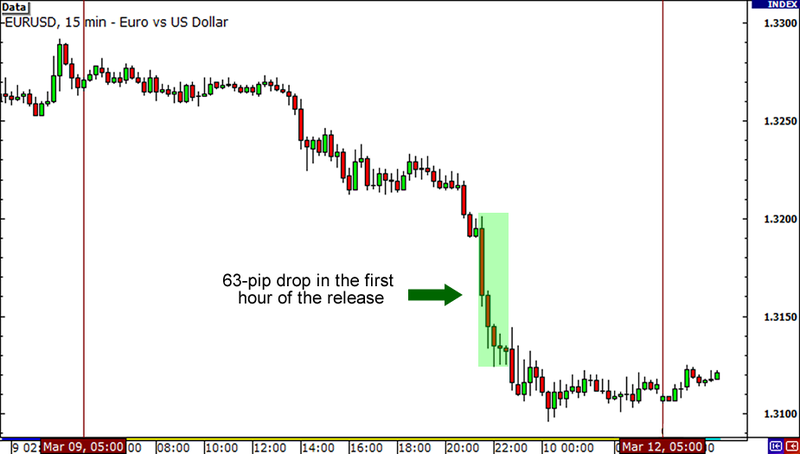 As we can see from the chart above, EUR/USD fell by as much as 63 pips in the first hour after the report was released. Also, unlike our observation a couple of months ago, the pair didn’t rebound for the rest of the session. Instead, the pair remained near its intraday lows where it closed. Now let’s take a look at GBP/USD. 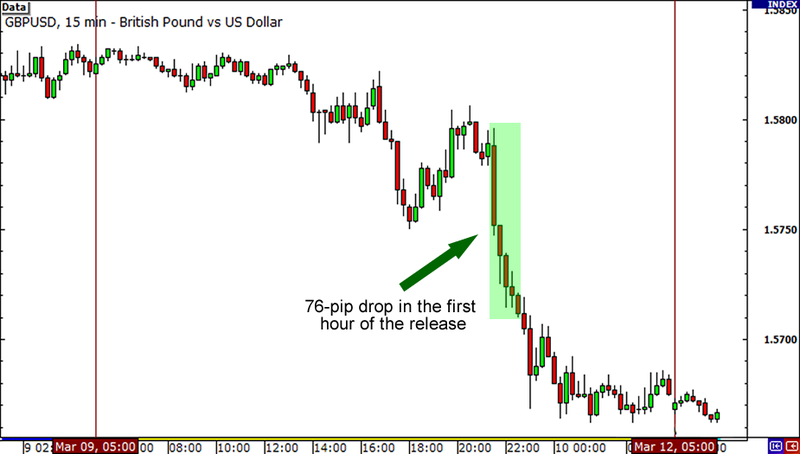 Like EUR/USD, Cable fell hard (around 76 pips) at the first hour after the report was released. Also, like EUR/USD, the pound wasn’t able to rebound against the dollar’s strength and instead ended the day near its intraday lows. If you’re optimistic on this month’s NFP release and are planning on trading one of these pairs, then you should probably note that the dollar rallied against the euro and the pound at the release of better-than-expected NFP numbers. You can probably try going for a directional bias and short on a break of the day’s lows. Before you trade the infamous NFP though, you gotta make sure that you set a stop loss!!! After all, you never know when a market curveball heads towards your trades. But if you’re not feeling too confident on your analysis or your bias, you can always trade on demo and just take note of the price action. Hey, no position is a position, right? Are you planning on trading this week’s NFP?